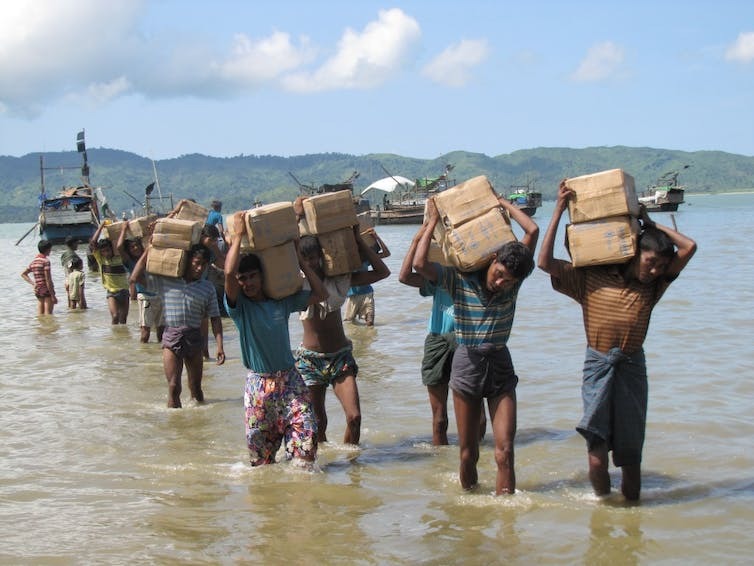 The Moghs [the Rakhine people of Myanmar] refer to us as ‘floating people’ as we do not have citizenship in our country. My grandfather, father, and I were all born and lived there… yet, I am considered a ‘temporary resident’. These words were spoken to me by Kalaya Ahmed, a 62-year-old man, whom I met in a refugee camp in Bangladesh in 2009. Ahmed is a Rohingya. This ethnic religious minority group has been persecuted by the Buddhist majority in Myanmar, assailed by special forces and monk militias. The United Nations has recently reported appalling atrocities against Rohingyas, including the killings of infants and children in Rakhine State, which Rohingyas call Arakan, its former name. The Burmese border security force calls us ‘Bengalis’ due to linguistic affinity and skin colour, even though we never came to Bangladesh before. And now I am living here in the camp. Ahmed is one of those thousands of Rohingya refugees who crossed the border into Bangladesh and is now living as a refugee. The huge displacement of Rohingyas over the past decade has led more than 400,000 people to flee to Bangladesh alone, and half a million to other countries. Central to their uncertainty is the question of the group’s political identity. Yet, despite all odds and efforts from the Myanmar authorities to deny Rohingyas any claim of belonging, Ahmed still identifies himself as a citizen of Myanmar and as a Rohingya; a term that the Myanmar government rejects. The Bangladesh government also rejects Rohingyas. It has recently released a proposal to relocate them to a flood-prone island. Such denial of rights from both sides has only prolonged the crisis. How do the Rohingyas identify themselves in the midst of such persecution? Empirical research among Rohingya refugees living in Bangladesh suggests that they understand identity politics very well. They construct their own identity through collective memory of their former life in Rakhine state and their new life in camps. These are expressed through narratives and cultural life using drawings and songs (taranas). They are highly significant in illustrating their sense of identity and belonging, and in expressing a different form of resistance, without direct confrontation or protest, against the discrimination and violence they have experienced. The use of drawings is quite common among the Rohingyas. They use drawings to tell stories to their children and to explain why they are in exile, and to send messages to outsiders interested in their case. Whether it is verbal expression or visual expression, a concept that repeatedly appears is persecution or violence. Anser Ullah, 37 years old, is an undocumented refugee from Maungdaw village, northern Rakhine state of Myanmar. He depicted religious violence and killing in his drawing below. We could not tolerate the persecution anymore. The military and Buddhist monks’ persecution on us has increased so much in recent time. Our ID cards were taken away by the military. We have been evicted from our land and village. Our relatives were killed and many are still missing. Military announced that if we want to stay in Maungdaw, we have to be like them. We have to follow their practice that requires females to uncover their heads when going out, and men to shave their beards and so on. Our mosques, madrasas and cemeteries are being destroyed, and pagodas established in their place. Reports show that incidents and destruction of cultural and worship spaces have been a regular practice. Songs are even more widespread in the Rohingya community. They are mainly country songs, religious songs and songs that describe everyday life in camp. Among these, country songs are the most popular. The song below was shared by a group of refugees in Nayapara camp to express their love and longing for their home. O, where are my beloved parents? A Rohingya Song from Nayapara camp, Bangladesh, recorded by F.Kazi Fahmida. The word “home” has a dual meaning in the Rohingya language: it refers to former houses in the village as well as home in the sense of the motherland, Rakhine. Memories of dried food on rooftops and fresh green chilli gardens are symbolic of that concept of life, that stability or peacefulness, which the Rohingyas have lost. Our memory should remain alive in our songs and poems. Our children should know why we are here. And if any outsider like you wants to listen us, they would listen to our songs and might understand our situation … We are not able to protest against anyone, so songs and poems are the only way to tell our sorrows and sufferings. As opposed to the official claim that the Rohingya are foreigners and settlers, Rohingya narratives and cultural expressions suggest that they are indigenous to Rakhine State. Arkan Deshor Musolman (Muslims of the Land of Arakan), film by F Kazi Fahmida. These narratives express a form of resistance, not only against their socioeconomic and political conditions, but also the identity that has been imposed on them by officials and society. Their songs are “weapons of the weak”. Rohingyas do not demand a separate state, but rather a separate identity and explicit recognition by the state. Through cultural expression, they remind themselves, and the world, of who they are. This is the second of a two-part series on the plight of Rohingyas in Myanmar and Bangladesh. Why America needs Marvel superhero Kamala Khan now more than ever?